For sportsbike riders who’ve never sat on a supermoto, the first five minutes on a Duke are an education. The upright riding position feels almost sinfully un-aerodynamic after a racing crouch, yet somehow just as poised. Part of this must be the delicacy and lightness of KTM’s throttle, clutch, gearbox and brakes. Harleys and Guzzis teach us that bikes with big wallops of low-revving torque should have tractor controls, so it’s a shock to find something as raw as the LC4 motor can be guided with so little effort. Your first 10 yards could be a feet-up U-turn, no problem. Even compared with Japanese singles, it’s a brilliant motor. With MCN tester Kev Smith on board it pops the front wheel up at 50-60mph, and holds it there all the way to top gear. But for this response you pay two penalties: vibration that numbs your fingers after a flat-out hour on a motorway, and a tendency to hunt at low speed on a steady throttle. If you travel in town, it takes skill to ride round this glitch. KTM tuner Craig Taylor at Dynotorque in Birmingham (0121 753 0415) considers a £350 Keihin carb to be the best money you can spend on a Duke. Despite winning multiple world championships, KTM are poorly known in the roadbike world. Are they reliable? " I’ve raced the same bike for three years without any breakdowns, " says Taylor. " You’ve just got to watch the oil level – not too much or too little. Sportsbike owners don’t realise that. " From the stock mid 40s bhp he reckons a different end can gets 49 or 50bhp. A new exhaust, cam, head job and 1mm overbore can get near 60bhp, but it’s about £1000. Without the overbore (the most expensive part due to the Nikasil barrel coating), expect mid 50s. But what you really buy a Duke for is a completely different style of handling. From a sportsbike perspective there’s no meaningful comparison because an R1 has hardly woken up by the time a Duke has run out of top speed. After five miles down a twisty road you are rapidly astonished by two things: how easy it is to snap the bike over onto its side, and how safe it feels to whack open the throttle at the soonest opportunity. Knee down is possible, but foot down is a whole new world. So how fast is it, really? If you bought a Duke, would your sportsbike-riding mates leave you for dead? Well, yes – on any road where they do more than 80mph. Below that you’ll match them for acceleration and braking, and possibly corner slightly faster because you can see further ahead. I suspect (but can’t prove) that extreme braking is slightly worse than the best sportsbikes because the Duke stoppies more easily as you dip below 30mph. 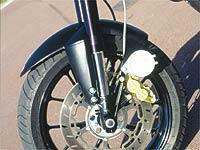 At high speed the short, steep-steering Duke is as likely to run out of stability as power. Stock suspension settings put the ride at the firm end of civilised. There’s a lot of mass in the forks and cowling which, with a sail of a rider attached to it, intent on big leans on bumpy back lanes, can flap around a bit. It never quite gets out of hand, and it’s only doing what all sportsbikes do at 140, but it’s the limit all the same. The bike drips with quality. Fully adjustable WP suspension, Magura bars, exquisite BBS wheels, Honda replica switchgear, lightweight screws, stainless steel oil lines, and hardened aluminium parts like the work-of-art brake pedal and eccentric chain adjusters. It’s all evidence that the Europeans can teach the Japanese a thing about mechanical beauty and satisfaction of ownership. You could spend two cans of lager and a summer’s evening gazing at the way the right side of the engine fits together. Shame about the weedy headlights, though. The Duke’s a mad indulgence, but it’s one of the most charismatic and beautiful motorcycles you can buy.